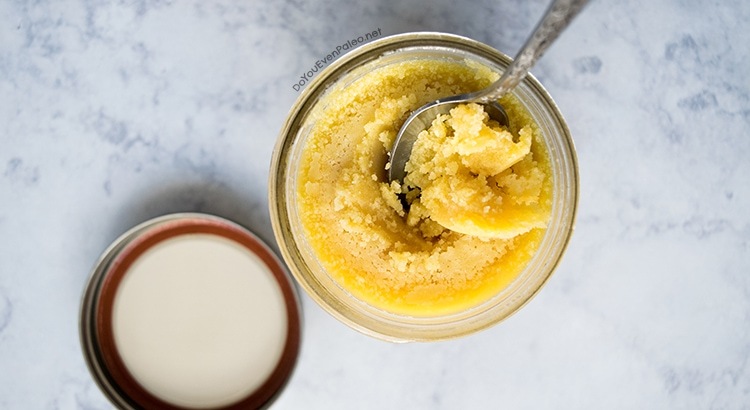 Ever wondered how to make homemade ghee? Or maybe you just want to know what ghee is? This tutorial should clear things up for you. Friends have asked me many times what this mysterious “ghee” thing is in my recipes, and I’ve often promised to put up instructions. Well, years later they’re finally here! 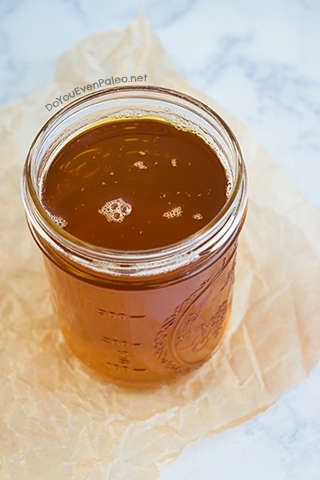 I’ve been making my own homemade ghee since I first went paleo. I quickly learned that it’s one of those pantry staples that is much more cost effective to make in my own kitchen. I don’t always have a big grocery budget, so I make whatever I can at home. Luckily, homemade ghee isn’t simply cheaper. The process is quite simple! 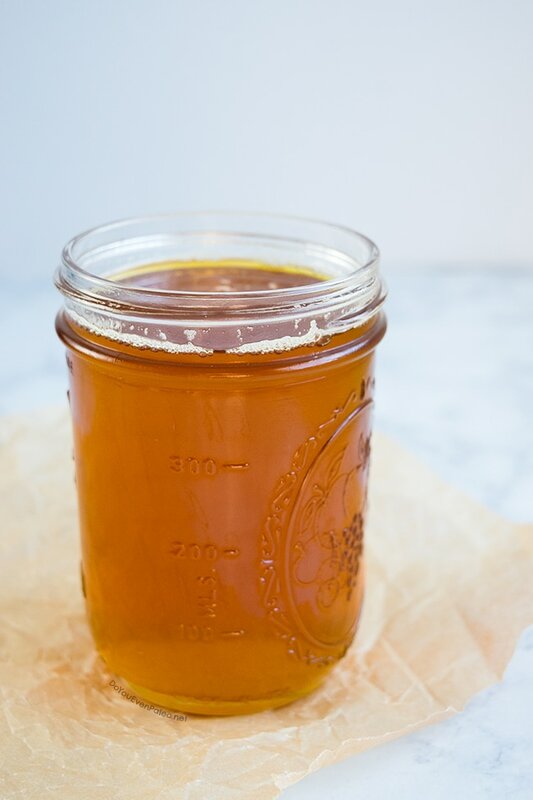 You’ll enjoy your own jar of liquid gold in no time. 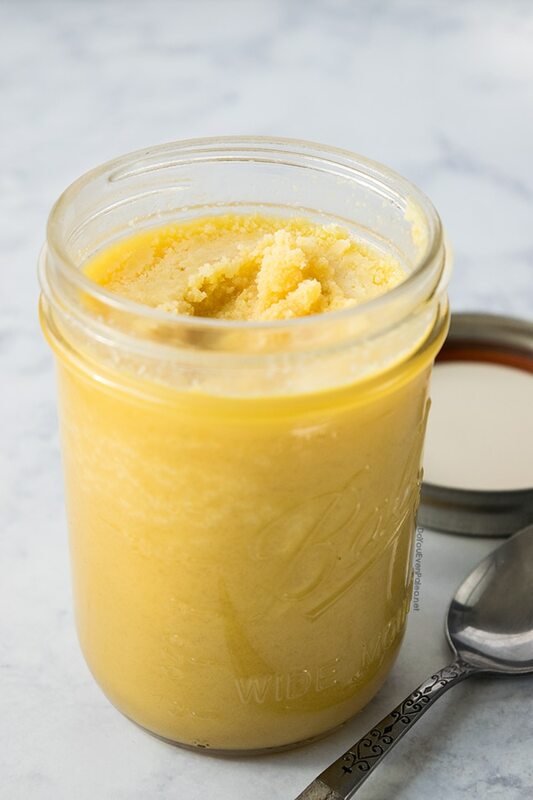 Put simply, ghee is butter that has been gently heated to separate the dairy solids. If you’re thinking of clarified butter (although I didn’t know what that was either before starting to make ghee), you’re on the right track. Ghee is a type of clarified butter, but it goes a little further. 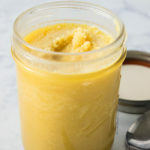 Traditionally, ghee was (and is!) 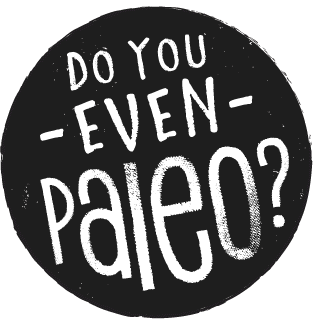 used in the Middle East, but thanks to Paleo it’s gained more widespread popularity. Why? Well, a strict paleo diet or a Whole30 eschews dairy, and butter is a dairy product. Butter is made up of water, milk solids, and butterfat. 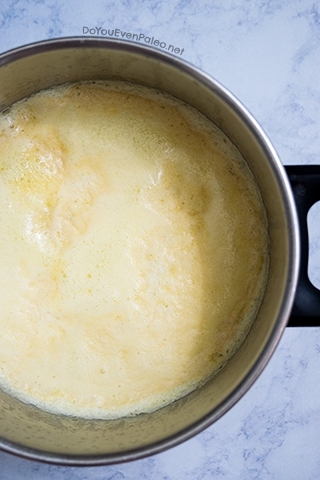 Take out the moisture and milk solids, and you’re left with pure butterfat—GHEE! Ghee has a high smoke point of 482 degrees F, which is actually higher than coconut oil. It’s excellent for searing, sautéing, pan frying…you name it. 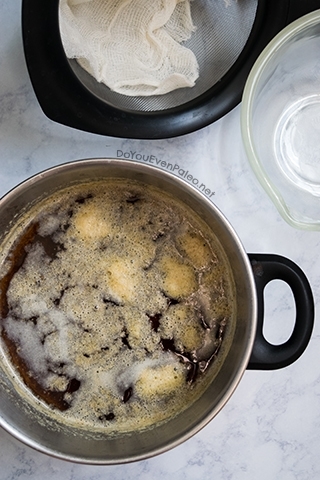 You can use it basically anywhere you’d use coconut oil or extra virgin olive oil. It won’t burn unless you heat it excessively. Toss vegetables in ghee prior to roasting. Sear your next steak in ghee. And of course it makes an amazing substitute for butter in baking! It’s hard to beat a little melted ghee on some paleo banana bread. Another bonus? Ghee has a long shelf life. Since you’ve taken the milk solids, moisture, and impurities out of butter, what you’re left with is shelf-stable. I keep a jar on the counter next to my stove, and I’ve never had it go bad. Supposedly the room temperature shelf-life is a 2-3 months. Alternatively, you can store it in the fridge and it will keep for much, much longer…in the ballpark of 6 months to a year. 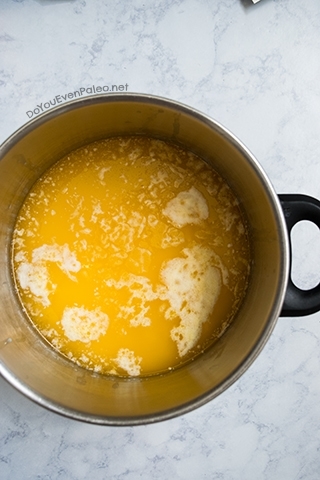 When cold, ghee will solidify just like coconut oil. Ghee is a source of medium-chain fatty acids (MCTs). You might recognize those as the stuff in coconut oil that everyone raves over. Well, ghee has them too. Your body uses MCTs for quick energy. There are other purported health benefits beyond this, mostly related to high quality ghee coming from grass-fed cows, but I’m going to skip those since I don’t want this to sound like a miracle cure. Finally? It just tastes great. Rich, buttery, nutty flavor. It’s more complex than butter, but still delivers the fatty smoothness that makes butter…butter. First thing’s first. Assemble your butter and your pot. Always use high quality butter. Trust me; I’ve tried butter that’s made with your standard, cheapest-butter-I-can-find, and it is not good. A few of my friends had only been eating ghee made with crap butter, and I immediately set them straight. The difference is HUGE. Anwyay, I use Kerrygold because it’s organic and grass fed. It’s the best stuff available to me locally. Many tutorials and pros out there will tell you to use unsalted butter, and if high-quality, grass fed or what have you butter is available to you unsalted, then go for it. Unfortunately for me, salted Kerrygold is the best stuff available to me…but I’ve never had an issue making ghee with unsalted butter. It only means that the bottom of your jar of ghee might get a little salty (but rub this on a chicken and roast it and omg). In theory you can use any amount of butter you’d like. 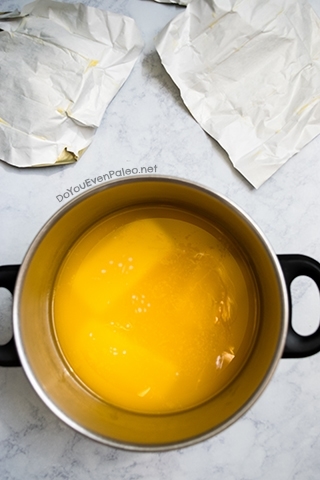 I usually use 1.5 pounds of butter per batch, which makes a little more than 2 cups of ghee. 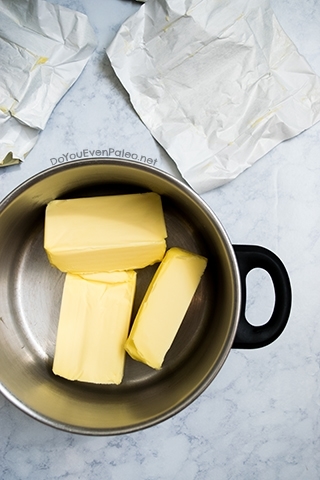 Then put your butter in your pot (deep pots are best) and set it over medium heat. It’ll start melting. You don’t have to stir. After the butter has melted, you’ll notice it almost immediately start to separate, as in the above left picture. See the foam starting to form on top? And if you look closely, you’ll notice the thicker layer on the bottom of the pot. At this point, the melted butter sputters a lot. I use a splatter guard to try and keep the mess to a minimum—but again, don’t stir. Next, it will start bubbling more vigorously, as in the next picture. More foam, more bubbles, more fun! 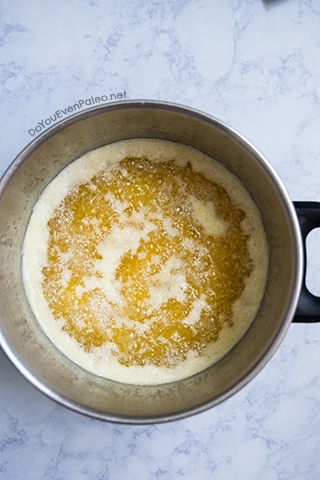 After that’s bubbled away for about 30 minutes, your ghee is probably ready to go. It’s completely covered in foam, which you can skim back to see the golden liquid beneath. It smells like heaven nutty buttered popcorn. Now I know a lot of people use a slotted spoon to remove the foam. I don’t. I’m sure someone is going to get angry at me in the comments for skipping this step. But I’ve never found it incredibly necessary. If you’re sensitive to dairy, you may not want to skip this step. Next, let the ghee cool a little bit and assemble a fine mesh strainer, some cheesecloth, and a heat-safe container to pour it into. You’ll notice that there appears to be less foam in the second pic. I didn’t skim it off; it just melts back into the ghee as it cools. 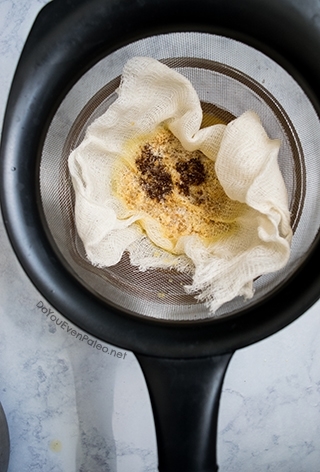 Now simply pour the ghee through a double layer of cheesecloth and fine mesh strainer. And you’re left with the milk solids (which, if you aren’t sensitive to dairy, you can still use) and the most gorgeous liquid gold. Ghee will lighten and solidify as it cools, but for now just gush over that brilliant golden color. Let the sunlight shine through it. It’s brilliant. Add butter to the pot and set over medium heat. Let the butter melt (no need to stir). After it’s melted, it will start to bubble and sputter. Don’t cover. Continue to cook over medium heat for 30-35 minutes to let the milk solids separate. Almost immediately, you’ll begin to notice the butter separating—a more solid layer on the bottom, a translucent middle layer, and foam on top. After about 30 minutes the mixture will smell very fragrant and nutty, almost like buttered popcorn. Using a spoon, you should be able to quickly pull back the foam layer and see through to the milk solids that are on the bottom of the pot. Remove from heat. (Optional) Use a large spoon to skim off the foam. I typically skip this step. Prepare a heat-safe bowl or jar with a mesh strainer overtop. Line the strainer with a double layer of cheesecloth. Pour the ghee over the cheesecloth and let it strain. 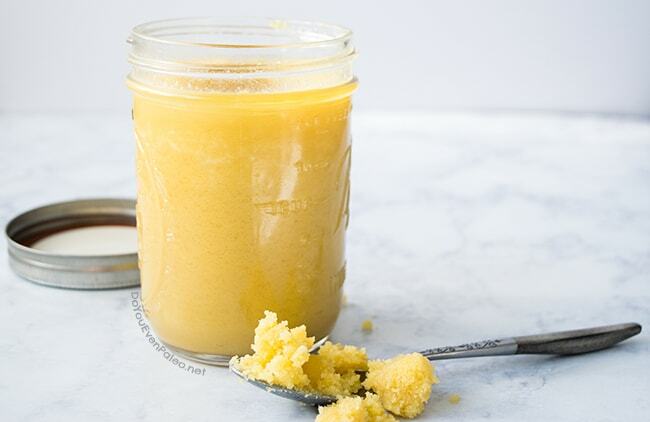 Store ghee in an airtight container at room temperature for 2-3 months or in the fridge for 6 months to a year. Don't subscribe All Replies to my comments Notify me of followup comments via e-mail. 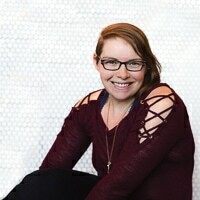 You can also <a href='https://www.doyouevenpaleo.net/comment-subscriptions/?srp=2178&srk=87505361eee98908ddf6ccb8681f50d6&sra=s&srsrc=f'>subscribe</a> without commenting.